Cybex LCX 425T - Light commercial treadmill gets high marks in reviews. Cybex 600R Commercial Treadmill - A machine for dedicated runners. Endurance TF3i - A no-frills folding treadmill with lifetime warranty. Endurance T6iHRC - Folding treadmill scores about average to above average in reviews for power, cushioning, programs, and noise. Endurance T8-HRC - health club-style features include a roomy walking area, quiet and powerful motor, superior cushioning, and a great warranty. Endurance T10HRC - Rates well in reviews for running area, deck cushioning, quality components, and a quiet ride. Epic A30T Treadmill - The A30T offers many of the same outstanding specs as the A35T and the A42T, but surfing the web on a black and white screen is the turn-off of this model. Epic A35T Treadmill - Everything you could want in a fitness machine that emphasizes entertainment features: web browsing, iFit Live technology, 40 workout programs. Epic A42T Treadmill - The array of features included on the Epic A42T will make you do a double take. But on closer inspection – is it all really worth a price tag of $3,200? Epic View 550 Treadmill - a solid, affordable TV treadmill. Reviews include this exciting model on Best Buy lists in leading consumer magazines. Epic 450 MX Treadmill - an entry level machine designed and built for the mass market. Epic 600 MX Treadmill - styling, components, programming, and console design are average at best. Fitnex T40 Treadmill - The T40 is a nice machine but it doesn’t come close to the value and features found on other mid-priced machines on the market. Fitnex T50 Treadmill - A heavy machine that looks like it should be able to support more than a 300-lb user weight, but the shorter tread belt could be a turn-off for some potential buyers. Fitnex TF55 Folding Treadmill - Built with quality components; pairing of the shorter 54" belt with a strong motor is a definite advantage. Fitnex T60 Treadmill - The T60 gets praise for its power, quality, quiet noise level, and cushioning, but only average marks for value. This is a powerful machine with some nice points. FreeMotion 750 Interactive Treadmill - The FreeMotion 750 offers an advanced incline / decline deck, plus a large AC motor, and a wide selection of programs and entertainment features. FreeMotion 770 Interactive Treadmill - A folding treadmill with many of the same features as the 750 model but with a more powerful motor and a touch screen display. FreeMotion 790 Interactive Treadmill - The FreeMotion 790 is a complete entertainment center loaded with a 15" TV screen attached, a 10" web browser, and a music port with speakers for an MP3 device. Freemotion XTr - a very nice machine with above average value depending on the price you pay; cushioning, low noise level, choice of components, and overall quality are first rate. Freemotion 3000 XLS - a health-club quality dream machine for under $2000. Freemotion 3500 XLS - high ratings for value, superior quality, durability, style and features. Gold’s Gym Trainer 480 - A budget treadmill good for a small apartment, suitable only for the lightest of walkers. Gold’s Gym Trainer 550 - Nice cushioning, quiet operation, strong value for a low price. We are impressed by all the positive comments left by owners in reviews. Gold's Gym Club Trainer 690 - a few nice features but nothing outstanding other than the individual weight input to get more accurate calorie-burn calculations during the workout. Gold’s Gym Trainer 1190 - A decent machine, but the price is a turn-off. We recommend that you don’t pay full price for it; wait until it sells for under $1000. Gold’s Gym Club Interactive 890 - A decent machine offering exceptional value if you can snag one on sale for around $800. In 9 out of 10 reviews, it exceeded expectations. Gold’s Gym CrossWalk 570 - A terrific treadmill with an amazing number of features for a machine priced at just $599. Gold’s Gym Maxx CrossWalk 650 - The Crosswalk 650 has been the best value budget machine on the market for a couple of years now. Gold’s Gym Maxx Competitor 1080 - Rates well for quality of the motor and belt, customizable deck cushioning, noise level, smooth operation and variety of programming. Healthrider H90t - If you can find the H90t at Costco for $700, it’s a decent value. Healthrider Club Series H120t - Comfortable, attractive, sturdy. Healthrider Club Series H130t - Not worth its price. Healthrider Club Series H140t - an overpriced TV model. Healthrider R65 - one of the least expensive treadmills with a 20” x 60” running surface. Healthrider H150i - An inexpensive starter model. Healthrider H750i - Total body workout with interactive cross training programs and a set of hand weights. Healthrider T600i - A decent buy if you can find it on sale. Horizon T303 - An updated model of the earlier T203, but the changes are minor. It still has an incredibly quiet motor and a hydraulic, folding lift system. Horizon T202 - The 2011 upgrade of the reliable T102. Heavy 196-pound machine holds up well under normal use thanks to quality construction and the durable motor. Horizon Evolve SG - an inexpensive and lightweight walker you can stow away in a closet or under the bed. Horizon T901 - Strong marks for quality and good value. Rated Good Buy. Horizon LS780T - Positive reviews and feedback from satisfied customers. Reliability, durability, and quality rank well, and the cushioning is a standout feature. Horizon T1201 - Quiet, sturdy competitor scores well in almost all areas of design and function. Horizon T71 - A lower end folding model. Horizon T72 - Another low-end model with a great-looking display panel and a short parts warranty. Horizon GS1040T - One of the best budget models from Horizon Fitness. Adjustable cushioning lets you pick surface choice from soft to hard. Horizon T73 - Suitable for light jogger on a budget. Horizon T100 - A discontinued entry-level model that is still available. Horizon has improved this budget treadmill considerably in the T101, which has landed on most Best Buy lists. Horizon T101 - One of the best treadmills on the market in under-$600 category. Horizon T102 - Positive reviews, good value for the money. Horizon T103 - This treadmill sets the bar higher for machines priced at $999. Horizon T91 - Good for light workouts. Horizon T6 - A good choice for runners and serious walkers looking for substance over entertainment features. Image 16.0 Q - Budget model for beginners. Image 15.0R - - A quality low end model. Image 17.5S - Rated average buy. The Image 19.0R - Good value for the price. The Image Advanced 1400 keeps your workouts interesting. The Image Advanced 3000 with upper body workout. Ironman 1911 - A competitively priced, basic, no-frills treadmill designed for serious workouts. Ironman 1921 - Above average in reviews for its power, low noise, cushioning, reliability, stability, design, and warranty. Ironman 150t - Above average for light workouts. Ironman 220t - A solid performer that has given owners years of use with no problems but quality and value don’t compare to other treadmills in this price range. Ironman Acclaim - Strong design and appealing overall package, yet still carries a monkey on its back by being from a fitness equipment company that went bankrupt. Ironman Inspire - Price doesn’t equal value. Ironman Triad - Shock-assist folding mechanism facilitates storage. Landice L770 Home ProSports Trainer - The best home fitness treadmill money can buy. Life Fitness T3 - Feels solid and it's well-built, but overpriced. Life Fitness T5-0 - Rates well in reviews but despite the quality of components, experts still question the high price. Life Fitness T5-5 - an upgrade of the T5-0 model: additional programming, advanced electronics, large tread belt, excellent power and cushioning, low noise, quality components. Life Fitness T7-0 - One of the best treadmills built exclusively for the home. Reviews rate this model outstanding in all areas of style, engineering, and performance. Life Fitness Club Series - Rated near perfect for power, cushioning, warranty, reliability, programs, comfort, and overall quality. A ‘Best Buy’ winner for 2010. Life Fitness F3 Advanced Folding - Just a really nice, solid machine with some of the best programming ever installed. This one leads the pack in stability and reliability for a foldable model. Lifespan Pro3 - A quality machine for runners with excellent cushioning, power, quality, and an easy-to-use console. Lifespan Pro5 - A quality residential treadmill rated for light commercial use. Lifespan TR100 - The slim design of this compact model makes it a top choice for people who need a handy cardio machine that can be slipped under a bed. Lifespan TR200 - At just 11" high when lying flat, this compact folding treadmill conveniently fits under a bed or stands up to store behind a door. Lifespan TR800 - A basic folding treadmill for light use with many of the same cool features as pricier Lifespan models including the hydraulic folding system and quality components. Lifespan TR1000 - Folding model gets good marks in reviews for cushioning, low noise level, heavy frame, HRC programs, warranty, and the folding system. Lifespan TR1200i - This folding treadmill gets an astounding number of positive reviews from customers for its ergonomics, sturdy design and self-folding mechanism. Lifespan TR2000 - Folding treadmill rates well in reviews for belt size, noise level, warranty, power, cushioning, programs, component quality, negative incline, step counter and overall value. Lifespan TR3000 - An attractive machine delivered at an incredible price. Lifespan TR4000i - Folding model has won numerous awards in reviews from Treadmill Doctor, Health Magazine and Runner’s Magazine; a very solid, powerful, and quiet machine. Lifespan TR5000i - The award-winning TR5000i has been hailed as one of the most innovative new models on the market while receiving outstanding reviews for its superior motor and overall value. Lifespan LS-5T - Lightweight and quick to fold up and store out of the way; easy to put together in about 15 minutes since it comes partially assembled. Livestrong LS7.9T - an impressive budget model standard equipped with power incline features and bells and whistles that were only found on machines in the $1200+ range just two years ago. Livestrong LS8.0T - A quality machine backed by a very good warranty for an entry-level treadmill; a top pick in the under $800 price class. Livestrong LS10.0T - An affordably priced quality treadmill with impressive specs and a decent warranty for the motor, parts, and service. Livestrong LS13.0T - The LS13.0T features a heavy-duty 3.0 CHP motor, a long 20" x 60" tread belt and advanced cushioning to minimize stress on knees and joints. Livestrong LS9.9T - BIG BIG value, arguably the best on the market right now. Larger motor at 2.75 CHP than any competitor priced under $1000. Livestrong LS12.9T - top marks for power, cushioning, belt size, noise level, warranty, and value-to-price ratio; all the features you've been looking for in a treadmill under $1300. Livestrong LS15.0T - A new folding model built for heavy-duty training and an extra long belt to accommodate people with longer strides. Livestrong LS16.9T - Best fold-up treadmill 2009 (Treadmill Doctor); a rock solid, stable platform to run indoors. Livestrong LSPro1 - Designed for runners, the LSPro1 offers a large motor, advanced cushioning system, a selection of challenging run programs, and a folding frame – all at a very attractive price. Livestrong LSPro2 - The LSPro2 gets a thumbs-up for its powerful motor, advanced cushioning, quiet operation, good warranty, and all the great programming features, especially the exciting Passport player. Livestrong T1X - The T1X is the company’s top-of-the-line model for use in a private home or light commercial (office or corporate) gym setting. Livestrong T1Xe - Costs $1000 more than the same T1X but includes the 7" LCD + TV screen instead of the LED display. That’s the only difference! Merit 725T Treadmill - The Merit 725T was the company's mid-range offering and is still available on a few sites, but is primarily found these days as a used model. Merit 725T Plus Treadmill - Suitable for most walkers but not recommended for runners. Nautilus T514 Treadmill - An entry-level model with a short warranty from a struggling company that should stick to home gym equipment. Nautilus T516 Treadmill - An over-priced model from a company not known for producing quality treadmill products. New Balance 1200 - Great for walking, holds up to light jogging. New Balance 1400 - Larger motor, a longer warranty, and a few more programs than the 1200 model. NordicTrack Incline Trainer X9i Interactive - Get in the best shape of your life with an incline that adjusts up to 40% and declines to 6%. NordicTrack Elite 9700 Pro - Key features include a big 4.0 CHP commercial motor (the best motor NordicTrack has ever used on a treadmill), an onboard web browser, a decline feature, a folding frame, and a big price tag. NordicTrack Commercial 1500 Treadmill - This model has been on best buy lists every year in its various incarnations - a great buy! NordicTrack Commercial 2450 - Plenty of extras users want for in-home use in a machine with a surprisingly low price tag for commercial quality core features. NordicTrack Elite 7500 Treadmill - a heavy, solid-built machine with great cushioning, a big motor, and superior components, designed to be a runner's machine with heavy use. NordicTrack Elite 9500 Pro - a nice blend of quality construction, fun entertainment, challenging workouts, solid framing, and an above average warranty; one of the best TV treadmills. NordicTrack T5 Zi Treadmill - The NordicTrack T5 Zi does the job for walkers and light joggers, and is considered a good deal at $649; an affordable way to get your daily cardio exercise. NordicTrack T9 ci Treadmill - Training Zone Indicator and Competition Training Center: race head-to-head against a variety of competitors. The NordicTrack A2550 Pro - an upgrade from the popular A2550 model which got rave reviews for quality and performance. The NordicTrack A2750 Pro - one of the best deals on the market ranking near the top in crucial areas such as deck size and cushioning, power, noise, programs, and reliability. NordicTrack C700 - An entry level machine for users who like a few extra features that keep boredom at bay with a variety of workouts. NordicTrack C900 - This new generation NordicTrack offers big value, a decent warranty, better parts, more power and cushioning, and a more attractive console. NordicTrack C1250 - Surf the Web while you work out; NordicTrack has pulled out all the stops to produce a new feature-rich treadmill for 2011. The NordicTrack Elite zi - Adjustable cushioning impacts your joints up to 33% less than road running. The NordicTrack Elite XT - a gorgeous TV treadmill with one of the most innovative and well-designed consoles you’ll find in a sub $2000 model. The NordicTrack Incline Trainer X3 - 40% incline burns 5 times more calories! NordicTrack X5i Incline Trainer - a treadmill for lightweight walkers who also like stair-stepper machines; not recommended until they put larger motors in these units. NordicTrack X7i Incline Trainer - Great for walkers who like steep uphill courses. Strengthens the cardiovascular system, burns fat fast; used by obese contestants on The Biggest Loser. The NordicTrack T7 si Treadmill - lots of quality features make this model an impressive, value-driven machine. The NordicTrack Apex 4500 Treadmill - an innovative new design with reflex deck cushioning. NordicTrack X5 - Best Incline Treadmill - Get a better workout of the glute muscles and a much more challenging cardio workout. The NordicTrack A2105 – Not a runner’s treadmill. The NordicTrack C2155 – iFit® workout card technology, one of the better ideas that the company has adopted for their line of treadmills. The NordicTrack C2200 - a lot of treadmill for little money. The NordicTrack Elite 2900 - State-of-the-art iFIT® technology brings personal trainer into your home. The NordicTrack Elite 3200 TV - Combat workout boredom and set your workout goals. NordicTrack S3000 Institutional Treadmill - An affordable health club model. NordicTrack Professional Series 3500 Treadmill - Great machine but overpriced. NordicTrack ViewPoint 3000 TV Treadmill - Rated 'Good Buy'. NordicTrack Commercial 1750 - An upgrade on the best-selling Commercial 1500 model which has been a favorite product for Icon Fitness for many years. Rated ‘Good Buy’. NordicTrack Reflex 4500 Pro - The ideal choice for walkers who need a treadmill with extra cushioning. Reduces impact on your joints by up to 40% compared to running on a road. NordicTrack Reflex 8500 Pro - Another model with a super-soft and forgiving surface that reduces impact on your joints by up to 40%; a decent buy for walkers who need extra cushioning. NordicTrack A2350 Pro - A solid entry level walking model, one of the cheapest that NordicTrack sells. The only real standout issue is that this model has no deck cushioning. 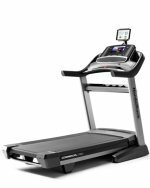 NordicTrack X20C Incline Trainer - New Incline Trainer addresses the problems with the X3 and X5i incline trainers, which suffered from a lack of power. Huge 5.0 hp high torque AC motor overcomes burn out problems. NordicTrack X11i Commercial Incline Trainer - Helps you burn calories up to 5x faster than on a traditional treadmill; beefed up components make it a dream to work out on. NordicTrack Commercial 2150 Treadmill - Lets you access workout videos in full color with iFit technology that brings the internet right onto your cardio fitness equipment. NordicTrack T5.5 - A budget model that has some fun, interactive features; this might be a decent start-up machine for some. NordicTrack T8.0 - The T8.0 treadmill is a slightly trimmer version of the T5.5 with some definite improvements such as a 3 CHP motor and workouts powered by Google Maps. NordicTrack T5.7 Treadmill - A solid and impressive machine for such a low price; decent entry-level model with a good motor, power incline, and a handy folding design. Pacemaster Gold Elite VR Treadmill - High ratings for its roomy walking area, challenging programs, noise, cushioning, power, quality components and overall value. Precor 9.27 - Streamlined model with a smaller footprint; multi-zone suspension system absorbs shock and lessens impact on the user's joints. Precor 9.35 - a well-built machine with power, quiet operation, advanced foot strike technology, superior cushioning, challenging programs, quality components and a solid warranty. The Precor M9.31 - A serious workout machine covered by a 10-year warranty. The Precor M9.33 - One of the quietest treadmills on the market. The Precor C956 - Save $1000s and enjoy years of punishing use by buying a remanufactured club treadmill. The Precor C962 - A remanufactured commercial-quality machine for the home gym. The Precor C964 - This remanufactured model is a steal at $2700! The Precor 966i - Own a Precor C966i commercial treadmill without breaking the bank. ProForm Pro 2500 - The feature-rich Pro 2500 has some fun gadgets such as a 7-inch Touch Screen Display and iFit Live™ technology, an innovative -3 degree decline feature, a big 3.5 chp motor, and new surface suspension system. ProForm Pro 4500 - The Pro 4500 goes big in all areas a runner wants: commercial-grade tread belt, full surface suspension, 1-Touch™ incline and the fold up design with hydraulic lift assist. ProForm 705 CST - The 705 CST is an upgrade of the 605Cs and is also nearly identical in specs to the Performance 600. ProForm 8.0 ZT - Earned a Best Buy award for 2011 from Treadmill Doctor in its price class ($400 to $699). ProForm Power 1080 - Rates well for power, quality, cushioning, reliability, running/walking space, and warranty, but don’t pay full price: catch it during a blowout sale. ProForm 850T - A good machine in terms of noise, cushioning, programs, power, and reliability, but the warranty is weak. ProForm Trailrunner 2.0 - One of ProForm’s best designed machines. Rates well in reviews for warranty, quality, noise, power, cushioning, running area and reliability. ProForm Trailrunner 4.0 - Best technology ProForm ever put into its cardio machines. Expect this model to go on sale in the near future with big savings of at least $500 or more off the retail price. ProForm Performance 400 - Ideal for seniors or casual walkers who want easy access to daily walking exercise without having to go outdoors; a ton of features for $599! ProForm Performance 600 - Above average scores in reviews; a decent budget machine for walkers with advanced features that are normally seen on more expensive models. ProForm Performance 900 - A runner's machine, new for 2011 at $1,999, but don’t expect that price to hold up, since Proform will drop prices dramatically during sales events. ProForm Performance 1450 - This machine with built-in web browser seems to offer everything you dream of in a treadmill, but the reviews on the touch screens have been a red flag, enough to make this model a questionable buy. ProForm 590T - an attractive model with some nice features including ProTech Cushioning, a 2.25 CHP Motor, and Quick incline and speed controls. ProForm Power 795 - A laundry list of advanced features but poor quality at a budget price will not mean a happy, worry-free experience of owning one. The ProForm XP 690T - Nice features and programs to pass the time while getting in the daily indoor miles. ProForm Power 690 - a standout model of the new 2010 line-up. Superior deck cushioning reduces impact on your joints by 15% compared to road running. ProForm Power 990 - good marks in reviews because of the better components and the advanced features such as iFit Live and the large 3 CHP motor. ProForm Power 995 - big 3.5 CHP commercial pro motor, iFit Live, a touch screen display, and a 20" x 60" belt, all for a sale price of $999? Awesome! ProForm 780 CrossWalk - a 20" x 55" walking area and powerful motor, decent quality and quiet operation, and a very nice console layout. The ProForm 7.0 CrossTrainer – one of the better concepts in a cardio and muscle building treadmill. The ProForm CrossWalk 300 – an unusual model with upper body workout arms! The ProForm 980 Audio Trainer - Kudos for reliability, cushioning, features, stability, and power. The ProForm 680 Trainer - A decent beginner’s machine with a couple of cool features, but don’t expect high quality for under $600. The ProForm 755 CrossTrainer - A great little machine with a lot of features. The ProForm 785CS - An average model for the price. The ProForm 570 CrossWalk - Underperformer in areas of power, reliability, quality, noise, and parts/labor warranty. The ProForm 480 CrossWalk - No solid value to match its price. ProForm XT 90 - The iFit Live technology will be very cool once it is fully developed, but until then, don't buy the hype. ProForm 600 ZNT - Best selection of programs of the current crop of Proform treadmills. ProForm Pro 2000 - The ProForm Pro 2000 has received good reviews for its size, power, cushioning, and 5-year parts warranty, as well as numerous mentions on Best Buy Lists. ProForm 610 RT - A folding model with a more compact deck and a good size 2.5 CHP motor. This model only makes sense when it goes on sale for around $800 or less. ProForm Pro 7000 Treadmill - Excellent performance and lots of workout options in a machine packed with extras to make your workouts more enjoyable. ProForm Pro 9000 - The Pro 9000 gets a resounding thumbs up from in-home users as well as trainers and athletes; ProForm's most feature-packed treadmill.